Definition at line 44 of file lltabcontainer.h. Definition at line 175 of file lltabcontainer.h. Definition at line 53 of file lltabcontainer.h. Definition at line 47 of file lltabcontainer.h. Definition at line 68 of file lltabcontainer.cpp. References FALSE, mDragAndDropDelayTimer, LLView::setMouseOpaque(), and LLFrameTimer::stop(). Definition at line 93 of file lltabcontainer.cpp. Definition at line 119 of file lltabcontainer.cpp. Definition at line 150 of file lltabcontainer.cpp. References addTabPanel(), FALSE, NULL, and TRUE. Referenced by addPlaceholder(), LLPanelAvatarClassified::callbackNew(), fromXML(), LLPreferenceCore::LLPreferenceCore(), LLPanelAvatarPicks::onClickNew(), LLPanelAvatarClassified::processAvatarClassifiedReply(), and LLPanelAvatarPicks::processAvatarPicksReply(). Implemented in LLTabContainer, and LLTabContainerVertical. Definition at line 205 of file lltabcontainer.cpp. References mCurrentTabIdx, mTabList, and LLView::removeChild(). Referenced by LLPanelAvatarClassified::deleteClassifiedPanels(), and LLPanelAvatarPicks::deletePickPanels(). Definition at line 341 of file lltabcontainer.cpp. Referenced by LLFloaterTools::refresh(), and LLPanelGroup::updateTabVisibility(). Definition at line 592 of file lltabcontainer.cpp. References addTabPanel(), border, BOTTOM, LLUICtrlFactory::createCtrlWidget(), FALSE, LLFloater::getFloaterHost(), initButtons(), mTabsHidden, LLPointer< Type >::notNull(), LLStringBase< char >::null, LLRectBase< Type >::null, NULL, LLPanel::postBuild(), S32, selectFirstTab(), LLPanel::setPanelParameters(), LLMultiFloater::setTabContainer(), TABCNTRV_TAB_WIDTH, LLStringBase< char >::toLower(), and TOP. Definition at line 124 of file lltabcontainer.cpp. Definition at line 228 of file lltabcontainer.cpp. References mCurrentTabIdx, mTabList, NULL, and S32. Referenced by LLPanelGroupRoles::activate(), LLFloaterWorldMap::adjustZoomSliderBounds(), LLPanelGroupRoles::apply(), LLPanelGroup::apply(), LLPanelAvatarPicks::callbackDelete(), LLPanelAvatarClassified::callbackDelete(), LLPanelGroupRoles::cancel(), LLPanelGroup::changed(), LLPanel::childGetVisibleTab(), LLPanelGroupRoles::deactivate(), LLFloaterDirectory::focusCurrentPanel(), LLMultiFloater::getActiveFloater(), LLPanelGroupRoles::getHelpText(), LLPanelGroupRoles::handleClickSubTab(), LLPanelGroup::handleClickTab(), LLTabContainerVertical::handleKeyHere(), LLTabContainer::handleKeyHere(), LLTabContainerVertical::handleMouseUp(), LLTabContainer::handleMouseUp(), LLPanelGroupRoles::hasModal(), LLPanelGroupRoles::needsApply(), LLPanelAvatarPicks::onClickDelete(), LLPanelAvatarClassified::onClickDelete(), LLPanelAvatar::onClickOK(), LLFloaterWorldMap::onPanBtn(), LLMultiFloater::onTabSelected(), LLMultiPreview::open(), LLPanelGroupRoles::postBuild(), LLPanelGroup::postBuild(), LLMultiFloater::removeFloater(), LLMultiFloater::setVisible(), LLFloaterWorldMap::show(), LLMultiFloater::showFloater(), LLPanelAvatarClassified::titleIsValid(), LLPanelGroupRoles::update(), LLPanelGroupLandMoney::update(), LLPanelGroup::updateTabVisibility(), and LLMultiPreview::userSetShape(). Definition at line 266 of file lltabcontainer.cpp. Referenced by LLFloaterVoiceWizard::draw(), LLTabContainerVertical::handleMouseDown(), LLTabContainer::handleMouseDown(), LLTabContainerVertical::handleMouseUp(), LLTabContainer::handleMouseUp(), LLFloaterMyFriends::instanceVisible(), LLFloaterLand::onClose(), LLFloaterTools::refresh(), and LLFloaterWorldMap::show(). Definition at line 285 of file lltabcontainer.cpp. Definition at line 276 of file lltabcontainer.cpp. References mTabList, NULL, and S32. Referenced by LLPanelAvatarClassified::apply(), LLPanelAvatarClassified::canClose(), LLMultiFloater::closeAllFloaters(), LLMultiFloater::draw(), LLFloaterChatterBox::getCurrentVoiceFloater(), LLPanelGroupRoles::postBuild(), LLPanelGroup::postBuild(), removeTabPanel(), LLMultiFloater::updateResizeLimits(), LLPanelGroup::updateTabVisibility(), LLPanelGroup::~LLPanelGroup(), and LLPanelGroupRoles::~LLPanelGroupRoles(). Definition at line 309 of file lltabcontainer.cpp. Referenced by LLPanel::childSetTabChangeCallback(), LLPanelAvatar::postBuild(), and selectTabByName(). Definition at line 297 of file lltabcontainer.cpp. Definition at line 567 of file lltabcontainer.cpp. References mTabList, LLStringBase< char >::null, and S32. Definition at line 235 of file lltabcontainer.cpp. Referenced by getTabPanelFlashing(), setTabChangeCallback(), LLTabContainer::setTabImage(), setTabImage(), setTabPanelFlashing(), and setTabUserData(). Definition at line 271 of file lltabcontainer.cpp. Referenced by LLPanelAvatarClassified::apply(), LLPanelAvatarClassified::canClose(), LLMultiFloater::closeAllFloaters(), LLFloaterVoiceWizard::draw(), LLMultiFloater::draw(), LLMultiFloater::getFloaterCount(), lockTabs(), LLMultiFloater::open(), LLPanelGroupRoles::postBuild(), LLPanelGroup::postBuild(), LLPanelAvatarPicks::refresh(), LLPanelAvatarClassified::refresh(), removeTabPanel(), LLMultiFloater::tabClose(), LLMultiFloater::updateResizeLimits(), LLPanelGroup::updateTabVisibility(), LLPanelGroup::~LLPanelGroup(), and LLPanelGroupRoles::~LLPanelGroupRoles(). Definition at line 531 of file lltabcontainer.cpp. References FALSE, LLButton::getFlashing(), getTabByPanel(), and LLTabContainerCommon::LLTabTuple::mButton. Definition at line 145 of file lltabcontainer.h. Referenced by LLTabContainerVertical::handleKeyHere(), LLTabContainer::handleKeyHere(), and LLMultiFloater::setCanResize(). Definition at line 78 of file lltabcontainer.h. Definition at line 77 of file lltabcontainer.h. Definition at line 716 of file lltabcontainer.cpp. References END, llmax(), mCurrentTabIdx, mLockedTabCount, mTabList, RIGHT_OF_CURRENT, and START. Referenced by LLTabContainerVertical::addTabPanel(), and LLTabContainer::addTabPanel(). Definition at line 155 of file lltabcontainer.cpp. Referenced by LLFloaterChatterBox::addFloater(), LLFloaterChatterBox::LLFloaterChatterBox(), and LLFloaterChatterBox::removeFloater(). Definition at line 457 of file lltabcontainer.cpp. Definition at line 502 of file lltabcontainer.cpp. Definition at line 511 of file lltabcontainer.cpp. Definition at line 467 of file lltabcontainer.cpp. Referenced by LLTabContainerVertical::initButtons(), and LLTabContainer::initButtons(). Definition at line 479 of file lltabcontainer.cpp. Definition at line 491 of file lltabcontainer.cpp. Definition at line 520 of file lltabcontainer.cpp. Definition at line 442 of file lltabcontainer.cpp. References LLTabContainerCommon::LLTabTuple::mOnChangeCallback, LLTabContainerCommon::LLTabTuple::mTabContainer, LLTabContainerCommon::LLTabTuple::mTabPanel, LLTabContainerCommon::LLTabTuple::mUserData, selectTabPanel(), LLPanel::setFocus(), and TRUE. Reimplemented in LLTabContainer, and LLTabContainerVertical. Definition at line 162 of file lltabcontainer.cpp. References LLFocusMgr::childHasKeyboardFocus(), getPanelByIndex(), getTabCount(), gFocusMgr, llmin(), mCurrentTabIdx, mLockedTabCount, mTabList, LLView::removeChild(), S32, selectTab(), LLPanel::setFocus(), TRUE, and updateMaxScrollPos(). Referenced by LLPanelAvatarPicks::callbackDelete(), LLPanelAvatarClassified::callbackDelete(), LLPanelAvatar::postBuild(), LLMultiFloater::removeFloater(), LLTabContainerVertical::removeTabPanel(), and LLTabContainer::removeTabPanel(). Definition at line 435 of file lltabcontainer.cpp. Definition at line 323 of file lltabcontainer.cpp. Definition at line 332 of file lltabcontainer.cpp. Definition at line 379 of file lltabcontainer.cpp. Referenced by LLPanelGroupLandMoney::activate(), LLFloaterChatterBox::addFloater(), fromXML(), LLPanelGroupRoles::postBuild(), LLPanelGroup::postBuild(), LLFloaterTools::postBuild(), LLPanelAvatarClassified::processAvatarClassifiedReply(), LLPanelAvatarPicks::processAvatarPicksReply(), LLFloaterTools::refresh(), and LLPanelAvatar::selectTabByName(). Definition at line 385 of file lltabcontainer.cpp. Referenced by LLTabContainer::addTabPanel(), LLPanelAvatarClassified::callbackNew(), LLPanelAvatarPicks::onClickNew(), and LLMultiFloater::setVisible(). Definition at line 391 of file lltabcontainer.cpp. References FALSE, mCurrentTabIdx, mTabList, S32, selectTab(), and TRUE. Referenced by LLTabContainerVertical::handleKeyHere(), LLTabContainer::handleKeyHere(), LLFloaterVoiceWizard::onClickNext(), and LLMultiFloater::selectNextFloater(). Definition at line 412 of file lltabcontainer.cpp. Referenced by LLTabContainerVertical::handleKeyHere(), LLTabContainer::handleKeyHere(), LLFloaterVoiceWizard::onClickBack(), LLMultiFloater::selectPrevFloater(), and LLPanelGroup::updateTabVisibility(). Referenced by LLPreferenceCore::LLPreferenceCore(), removeTabPanel(), selectFirstTab(), selectLastTab(), selectNextTab(), selectPrevTab(), LLPanelAvatar::selectTab(), selectTabPanel(), setValue(), and LLFloaterMyFriends::showInstance(). Definition at line 364 of file lltabcontainer.cpp. References FALSE, getPanelByName(), llendl, llwarns, and selectTabPanel(). Referenced by LLPanel::childShowTab(), LLPanelAvatar::selectTabByName(), and LLFloaterTools::showPanel(). Definition at line 349 of file lltabcontainer.cpp. References FALSE, mTabList, S32, and selectTab(). Referenced by LLPanelGroupRoles::attemptTransition(), LLPanelGroup::attemptTransition(), LLPanelGroupRoles::handleNotifyCallback(), LLPanelGroup::handleNotifyCallback(), onTabBtn(), LLPanelGroup::postBuild(), LLMultiFloater::selectFloater(), LLPanelGroup::selectTab(), selectTabByName(), and LLMultiFloater::showFloater(). Definition at line 583 of file lltabcontainer.cpp. Definition at line 124 of file lltabcontainer.h. Definition at line 143 of file lltabcontainer.h. Definition at line 142 of file lltabcontainer.h. Referenced by LLMultiFloater::LLMultiFloater(), and LLMultiFloater::setCanResize(). Definition at line 248 of file lltabcontainer.cpp. References getTabByPanel(), LLTabContainerCommon::LLTabTuple::mOnChangeCallback, and tab. Referenced by LLPanel::childSetTabChangeCallback(), LLGroupMoneyTabEventHandler::LLGroupMoneyTabEventHandler(), LLPanelGroupRoles::postBuild(), LLPanelGroup::postBuild(), and LLFloaterWorldMap::postBuild(). Definition at line 550 of file lltabcontainer.cpp. References getTabByPanel(), LLTabContainerCommon::LLTabTuple::mButton, LLFontGL::RIGHT, and LLButton::setImageOverlay(). Referenced by LLFloaterChatterBox::addFloater(), and LLFloaterChatterBox::draw(). Definition at line 541 of file lltabcontainer.cpp. References getTabByPanel(), LLTabContainerCommon::LLTabTuple::mButton, and LLButton::setFlashing(). Referenced by LLFloaterIMPanel::addHistoryLine(), LLMultiFloater::setFloaterFlashing(), and LLFloaterIMPanel::setVisible(). Definition at line 257 of file lltabcontainer.cpp. References getTabByPanel(), LLTabContainerCommon::LLTabTuple::mUserData, and tab. Definition at line 559 of file lltabcontainer.cpp. Definition at line 577 of file lltabcontainer.cpp. Definition at line 76 of file lltabcontainer.h. References LLSD::asInteger(), S32, and selectTab(). Referenced by removeTabPanel(), and reshape(). Definition at line 189 of file lltabcontainer.h. Definition at line 177 of file lltabcontainer.h. Referenced by deleteAllTabs(), getCurrentPanel(), getCurrentPanelIndex(), insertTuple(), removeTabPanel(), selectNextTab(), selectPrevTab(), LLTabContainerVertical::selectTab(), LLTabContainer::selectTab(), and setCurrentTabName(). Definition at line 186 of file lltabcontainer.h. Referenced by LLTabContainer::handleDragAndDrop(), LLTabContainerCommon(), and setDragAndDropDelayTimer(). Definition at line 195 of file lltabcontainer.h. Referenced by insertTuple(), lockTabs(), and removeTabPanel(). Definition at line 184 of file lltabcontainer.h. Referenced by LLTabContainerVertical::draw(), LLTabContainer::draw(), LLTabContainer::handleDragAndDrop(), LLTabContainerVertical::handleHover(), LLTabContainer::handleHover(), LLTabContainerVertical::handleMouseDown(), LLTabContainer::handleMouseDown(), LLTabContainerVertical::handleMouseUp(), LLTabContainer::handleMouseUp(), LLTabContainer::handleToolTip(), scrollNext(), LLTabContainerVertical::selectTab(), LLTabContainer::selectTab(), LLTabContainerVertical::updateMaxScrollPos(), and LLTabContainer::updateMaxScrollPos(). Definition at line 180 of file lltabcontainer.h. Definition at line 182 of file lltabcontainer.h. Referenced by LLTabContainerVertical::draw(), LLTabContainer::draw(), scrollNext(), scrollPrev(), LLTabContainerVertical::selectTab(), LLTabContainer::selectTab(), LLTabContainerVertical::updateMaxScrollPos(), and LLTabContainer::updateMaxScrollPos(). Definition at line 183 of file lltabcontainer.h. 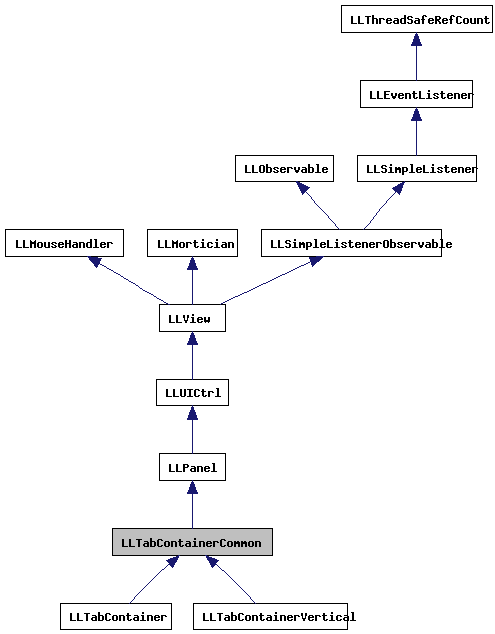 Referenced by LLTabContainerVertical::draw(), and LLTabContainer::draw(). Definition at line 181 of file lltabcontainer.h. Definition at line 176 of file lltabcontainer.h. Referenced by LLTabContainerVertical::addTabPanel(), LLTabContainerVertical::commitHoveredButton(), LLTabContainer::commitHoveredButton(), deleteAllTabs(), LLTabContainerVertical::draw(), LLTabContainer::draw(), enableTabButton(), getChildByName(), getCurrentPanel(), getIndexForPanel(), getPanelByIndex(), getPanelByName(), getPanelIndexByTitle(), getPanelTitle(), getTabByPanel(), getTabCount(), LLTabContainer::handleDragAndDrop(), LLTabContainerVertical::handleMouseDown(), LLTabContainer::handleMouseDown(), LLTabContainerVertical::handleMouseUp(), LLTabContainer::handleMouseUp(), LLTabContainer::handleToolTip(), insertTuple(), LLTabContainerVertical::removeTabPanel(), LLTabContainer::removeTabPanel(), removeTabPanel(), selectLastTab(), selectNextTab(), selectPrevTab(), LLTabContainerVertical::selectTab(), LLTabContainer::selectTab(), selectTabPanel(), setCurrentTabName(), LLTabContainer::setPanelTitle(), LLTabContainerVertical::updateMaxScrollPos(), LLTabContainer::updateMaxScrollPos(), and ~LLTabContainerCommon(). Definition at line 194 of file lltabcontainer.h. Referenced by LLTabContainer::addTabPanel(), getTabPosition(), LLTabContainer::getXML(), and LLTabContainer::initButtons(). Definition at line 178 of file lltabcontainer.h. Referenced by LLTabContainer::draw(), and fromXML(). Definition at line 191 of file lltabcontainer.h. Definition at line 193 of file lltabcontainer.h. Referenced by LLTabContainerVertical::addTabPanel(), LLTabContainer::addTabPanel(), LLTabContainerVertical::draw(), LLTabContainer::initButtons(), setTopBorderHeight(), and LLTabContainerVertical::updateMaxScrollPos().